Duchovny’s feet are firmly planted on the ground when it comes to discussing the European run of dates which kicks off this week in Moscow and winds up on 22 February in London. I knew if I bought a $3,000 guitar I would be so disappointed in myself if I didn’t play it. The thing is, while fans of Duchovny’s TV and movie work may part with their cash out of curiosity, the X-Files star has tunes to back up the chutzpah of a well-known face launching a music career in his 50s. 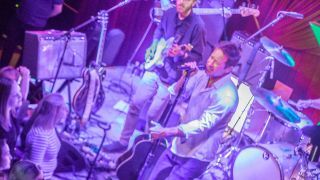 If Duchovny’s 2015 debut Hell or Highwater was the sound of a relatively inexperienced musician finding his feet, 2018’s Every Third Thought is a marked step up, filled with assured songwriting and his ever-increasing confidence as a musician and singer. Even better, it’s all rooted in the 58-year-old’s most treasured influences. As Duchovny (who is also an acclaimed author with three novels under his belt since 2015) prepared to head out to Moscow for that first show, we caught up with him to talk his unlikely solo career, the joy of his precious Martin and how he’s bravely battling against gear acquisition syndrome. “That’s putting it kindly [laughs]. It was very late. I think I gave it a shot when I was about 10 for maybe a couple of lessons but unfortunately, to my eternal disappointment, I didn’t keep at it. Then when I was about 50, I just decided that I wasn’t going to go to my grave not knowing how to play an instrument. "I love music and have a lot of downtime as an actor. You’re in your trailer a lot so I thought why couldn’t I be sat there just playing along to music? That was really the first step. Was that your Martin D-18GE 1934 reissue? What attracted you to that particular guitar? “Oh god, this is so superficial. I liked the way it looked. I like the sound of Martins, they’re deeper, I mean I didn’t know any of this when I went to buy the guitar. "I played a couple of the guitars that they had and I liked what they told me about the Martin, and that was that it’s not as bright as some of the others and it has this deep tone. I responded to that. That guitar has clearly stayed with you – why is that? Have you become a gear collector at all? Are you drawn more towards the acoustics? How did that progress to making two albums and going on world tours?! “Unfortunately, that progression has been the demise of my guitar playing. I would say four years ago I was the best guitar player that I have been. Then, as I started recording and I realised that I might perform live I realised I really had to work on my voice if I wanted to get the most out of that instrument. How intimidating was it to put yourself out there as a musician? People love to shoot celebrity side projects down! “That’s just human nature! Nobody wants to re-evaluate. It’s like, ‘I know that he was an actor, I don’t have the time or energy to re-evaluate this mother fucker! Why can’t he just do what he does and keep doing that?’ I knew there would be that. Every Third Thought sounds like an album made by someone much more confident in their songwriting skin than Hell or Highwater - is that a fair judgement? “Yeah, way more. I’ve done it twice now, I’ve written almost 40 songs and that’s a lot of songs. I guess I can say I’m a songwriter now! I can say that and not have to defend that. "Hey, I might have to defend it to some people but I don’t have to defend it. I’ve done it 40 times and that’s a bit. I am more confident in my singing as well and I can stretch it out more in recording and in orchestration and arrangement. Does your process tend to involve you sat with the Martin that we mentioned earlier? Looking ahead to the February tour, are there any stops that you’re particularly looking forward to?